World Cup overall champion while still a teenager Austrian ski-jump sensation Gregor Schlierenzauer will be the man to beat at the 2010 Vancouver Games and in fact threatens to dominate the sport for years to come. Deaf since birth in his left ear, he leapt to the 2006 world junior title, but his progress at senior level is even more staggering having won the 2009 World Cup overall crown after finishing fourth at 17 in 2007 and second in 2008. 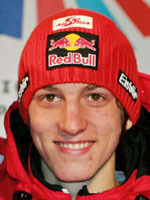 At 19 he already has four world titles to his name, two team crowns (2007, 2009) as well as the individual and team ski-flying titles picked up in 2008. He became the sport's youngest ever world champion when he took the ski-flying title at 18 when he first discovered the non-Olympic discipline at Obertsdorf. This latest phenomenon won five World Cup events in 2006-07, six the following season and a record 13 in 2008-09 to better Janne Ahonen's previous mark by one. The Austrian stood at 24 wins following the 2009 season and 41 podiums in 71 events at the conclusion of the pre-Olympic season. Schlierenzauer grew up in the quiet city of Fulpmes, a town of 4000 inhabitants just 15km from Innsbruck, a regular venue on the World Cup circuit which hosts the third stage of the Four Hills tournament. The teenager has yet to win this prestigious competition having finished second in 2006-07 and third the following year. He took up ski-jumping at nine despite his first love for football. His swift progression opened the door to the national sports academy at Stams where athletes of a number of sports are groomed. Schlierenzauer's family was unfamiliar with ski-jumping although his father Paul was a handy Alpine skier. It was his friendship with teammate Mario Innauer, whose father Toni has been head of the Austrian team since 2007 and was normal hill Olympic champion in 1980 at Lake Placid, that helped speed up his progress and develop a championship winning style. Away from the circuit, the new star also benefits from the advice of his uncle Markus Prock, himself a triple Olympic medallist in the luge and now Schlierenzauer's agent. He has a dynamic personality and is a gifted player of poker while he also loves surfing, music and cooking. On a down note, his 2008-09 campaign finished in misery when he suffered a serious knee injury in March at Ramsau while testing skis for the upcoming Vancouver Games. He underwent urgent surgery and hopes the injury will not hinder his chances for Olympic gold at Whister Olympic Park where he won a World Cup event in January 2009.